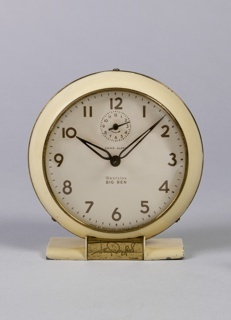 See more objects with the tag timekeeping, designers, print collectors, printmakers, baroque, time. See more objects with the color rosybrown sienna saddlebrown or see all the colors for this object. 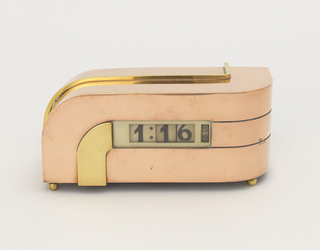 This and 129 other objects are a part of a set whose first object is Book (France). This is a Print. 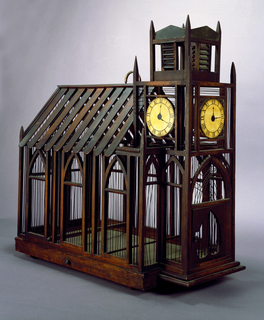 It is dated 1705–12 and we acquired it in 1921. Its medium is etching printed in red ink on paper. It is a part of the Drawings, Prints, and Graphic Design department. 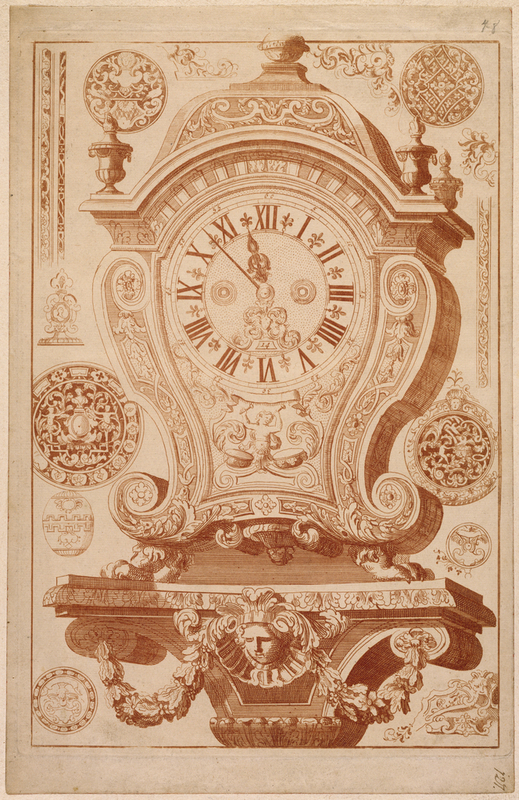 This etching for the upper part of a clock features a caryatid beating upon a pair of drums, alluding to the rhythm of the clock’s mechanism. The margins of the sheet are filled with alternative designs for clock faces and other ornaments. 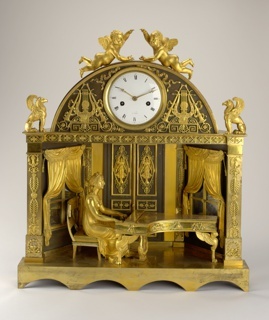 The design could have been executed in polychrome wood marquetry or with a tortoiseshell and brass veneer in the style of André-Charles Boulle. The seventeenth and eighteenth centuries saw the proliferation of ornament prints, a useful resource for artisans wanting to stay current with the latest design trends. Daniel Marot produced a vast number of prints, having learned the technique of etching from his father. As court artist to William III of Orange, Marot was the central figure in the creation of the William and Mary style, the Anglo-Dutch expression of courtly Baroque style. He was among the Huguenots who fled France and took refuge in Holland following the Revocation of the Edict of Nantes in 1685. The migration of Protestants helped to disseminate the French style internationally. The dense profusion of ornament in this design closely resembles the work of the French court artist Jean Berain, particularly in the flat, interlacing band work enlivened by classicizing swags and urn forms. 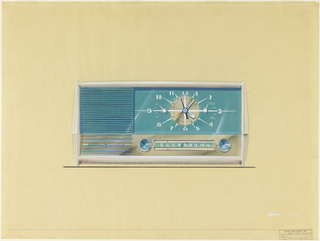 This object was catalogued by Karin Zonis. It is credited Purchased for the Museum by the Advisory Council. Inscribed in graphite, upper right: 78; in black ink, lower right: 127. This object was previously on display as a part of the exhibitions	Hewitt Sisters Collect and The Huguenot Legacy: English Silver, 1680-1760 from the Alan & Simone Hartman Collection.